Over the decades, the state has had very little global marketing muscle behind its wines. Some family-owned start-ups have certainly enjoyed spectacular success. The investment by the Drouhin family was (and still is) extremely important to Oregon image-building. More recently, Northwest giant Ste. Michelle Wine Estates purchased the pioneering Erath winery. Along with Precept Wine, which owns considerable vineyard holdings, and King Estate, the state’s premier producer of pinot gris, that is it for companies with an opportunity to actually promote the wines of the region, rather than just their own portfolio. The colorful Rainstorm labels depict Portland icons: salmon, sneakers, bicycles, coffee, guitars, clouds, and plenty of wine grapes. “We may get a lot of rain in Oregon, but we’re hardly washed up. We’re weird. We’re wired. And we’re always inspired,” notes the brand's website. 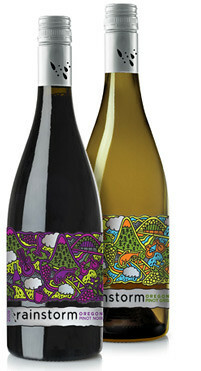 The first two releases celebrate not only the uniqueness of Oregon, but smartly pinpoint the state’s success to its book-end pinots – gris and noir. Both wines are made in the modern mode, which is to say, low alcohol (12.5%), terroir (not barrel) flavored, food-friendly, and most of all, affordable. The 2011 Rainstorm Pinot Gris ($12) is bone dry, immaculately fresh, lees-aged, with lovely depth and finesse. Flavors of melon and cucumber dominate, and the crisp acidity offers bracing minerality instead of simple sourness. The 2009 Rainstorm Pinot Noir ($16) vaults to the top of the list of Oregon’s best pinot noir values. Complex and substantial, this first effort, Quillé explains, was assembled from existing lots of wine carefully sourced from specific growers. Future vintages will lock come from locked-in, long term contracts, offering a consistency rare in such supermarket wines. Quality, consistency, style and affordability. With wines like these, who minds a little rain? had this a couple months ago, cannot compete with the similarly priced Joe Dobbes, Wine by Joe Pinot, not even close. Clive, I've had both, and with all due respect, this is a much classier bottle IMHO. Paul, what do you mean by classier? I haven't had the chance to try these yet, tho I will soon. I should add that the Wine by Joe Pinot is a very good bottle, and sells for even less. By classier, I mean more elegant, less full throttle. A different style, but no disrespect intended. Well made, affordable Oregon Pinots used to be a rarity; now (at least until the next grape shortage) they seem to show up more frequently. Got it, thanks Paul. Elegance, balance, symmetry in wine is a good thing. Looks like I only left half my thought in my original post. Sorry about that. As far as well made affordable Oregon Pinot, check out Lorelle if you haven't yet. A private label for C&G, good stuff at foughly $15 on the shelf. Looking foward to trying the wines noted above. The good news is that both Rainstorm and Wine by Joe are cheap enough that you can buy both and compare for yourself! Love the package. I'll look of it when we're in Oregon... Probably easier for me to find there. Paul, the next time you are in the Red Mountain area, stop into Benton City, and just past the bridge, to the left, at the "Ranchito" something or other, check out the vineyard signs reading such things as "REISLING" and "PINOT MORE".